Restore law and order as a streak of murders plagues the city. "If you love the Emily Delicious series, you will love Parker and Lane: Criminal Justice. It gets you out of the restaurant business and into the business of solving crimes. You'll be dealing with the police, processing crime scenes and collecting evidence like a CSI. These types of Time Management games are the best. Great story, funny and intriguing. Lots of levels and plenty of challenge to get the gold rating. It will keep you coming back just to find out whodunnit." Lily Parker is a smart and righteous detective who works hard to put criminals behind bars and make the world a better place, even if her own life is a mess. Victor Lane is a smug but charming criminal defense attorney who doesn’t care who he’s defending as long as he’s getting paid. He’s also the best at his job. When some of the criminals Lane defended in the past start dying, Parker’s forced to work with him to find the culprit. Could it be one of the criminal’s victims? Or perhaps some kind of vigilante? Is Lane himself being targeted? 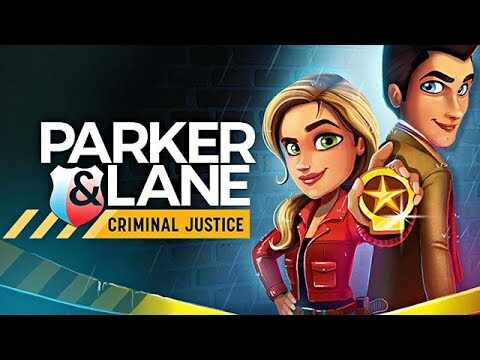 Feel the thrill of the chase and prove that your detective skills are second to none in Parker and Lane: Criminal Justice. Interesting storyline that kept me playing. Banter between the two main characters is very funny. I like the way the forensics evidence is gathered. This is a game with a replayable factor for sure. Cool soundtrack with some adult dialogue -- not for children. Colors are bright and the characters are drawn sharply, all in all a smooth, solid and modern game. I would like to see them return with another case to crack. This Time Management game is my favorite. Reminds me of some of the Delicious Emily games. It has a lot of items to find, while also interacting with other characters. I think it is well worth the money. With a new approach to criminal cases, this game is challenging and really fun to play. The graphics are great as usual, and the mini gamesare intriguing. I really enjoyed this game, it kept me going. I was trying to figure out who could possibly have committed the murders. It was a very good plot because when you thought someone had done it, that person turned up a victim. I would recommend this game to others. This game is very addictive. Great cast of characters. There is a lot of humor and mystery in the story lines. Love this game. It's like the Delicious Emily games and I love it! Great style, great characters, great graphics and a great story. Buy it and you will love it too! I absolutely love this game. I am a die-hard fan of all simulation games. This is a very addicting game. It's a must play.